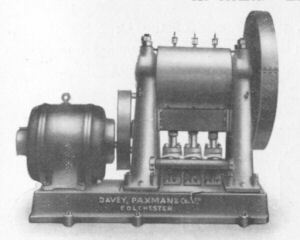 Page 47 of the Paxman Heavy-Fuel-Oil Engines catalogue No 952, prepared in December 1928, carries an advertisement for Paxman Hydraulic Machinery. This states "We have recently acquired the business of the West Hydraulic Co., Ltd., and have transferred technical staff, drawings, records, patterns, etc., to our Works at Colchester, where we have much better facilities for manufacture than obtained in the Luton Works." 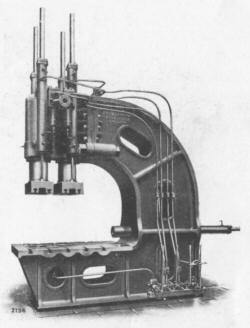 From this we can reasonably conclude that Paxman acquired the West Hydraulic business in 1928. A similar advertisement appears on page 51 of Paxman's Heavy-Fuel-Oil Engines catalogue No 987. At present these advertisements provide the main information we have about Paxman's acquisition of The West Hydraulic Engineering Co Ltd of Luton. Catalogue No 987 carries no date, but from other information in it we can be reasonably certain it was published c.1931. The text, three illustrations and captions (but not the precise layout) of the Hydraulic Machinery advertisement which appears on page 51 of that catalogue are reproduced below. We have acquired the business of the West Hydraulic Co. Ltd, and have transferred technical staff, drawings, records, patterns, etc., to our Works at Colchester, where we have much better facilities for manufacture than obtained in the Luton Works. Horizontal Hydraulic Pumps up to large capacities. We shall be pleased to send descriptive catalogue on request. From the above we can reasonably assume Paxman did produce a catalogue of this hydraulic machinery but we are not aware of any copies having survived. and so on, in small numbers through to the 1930s. As Paxman started to receive orders for hydraulic equipment in 1927, one wonders whether initially it made this equipment for West Hydraulic before acquiring the company the following year. 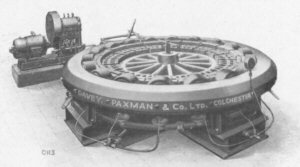 Andrew and I would be very interested to receive any more information about Paxman's hydraulic machinery during the late 1920s and the 1930s, or about its acquisition of the West Hydraulic Engineering Co Ltd.